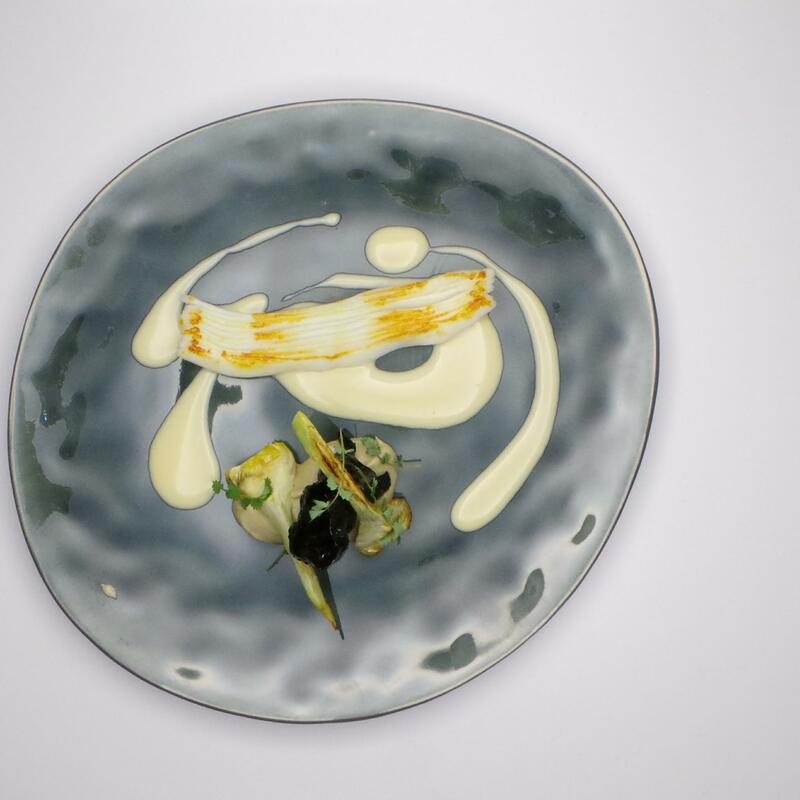 Mauro Colagreco, chef of Mirazur, the highest ranked restaurant in France, according to the World’s 50 Best restaurants, likes to showcase the ingredients that come from his location in Menton just on the border with Italy. At Chef Sache in Cologne, he presented three fish based dishes to showcase the quality of the ingredients of the area. He opted to use collagen in different ways to show how this natural ‘gelatine or glue’ from fish can be used to bring out not only flavour but also creativity. He therefore uses fish or some pieces of fish, such as the offal, which might otherwise be thrown away. Colagreco said collagen could be used either as a glue or as an emulsion. 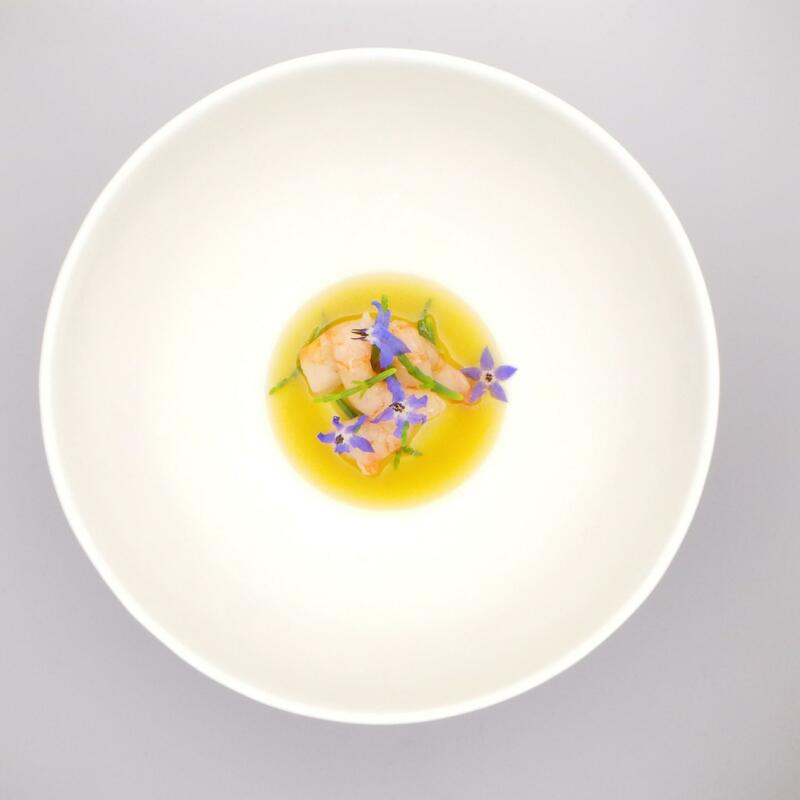 The first dish he presented was a classic fish soup which was turned into a gelatine and served with a langoustine from San Remo which is very typical of the region. 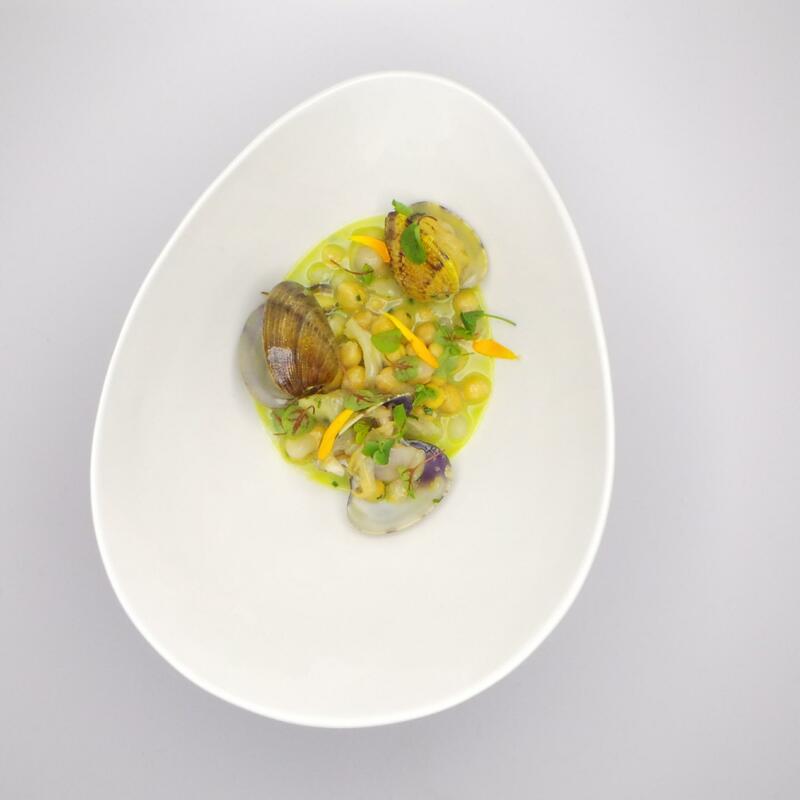 The Argentinian chef made a classic fish soup using onions, fennel and garlic. He aromatised it with saffron and, like in bouillabaisse, added orange skin and olive oil, tomatoes, cumin and pepper. Colagreco said that for this fish soup he likes to use small fish which would otherwise be thrown away. Colagreco said that he adds monkfish to the stock because it has a lot of collagen. He lets the stock reduce by half and then places it in the fridge so that it becomes a jelly without any additive. “It is a stock which becomes a gelatine,” he said. He then brings it out to melt and then clears the stock using either a cloth or kitchen paper to remove impurities. The stock is left at room temperature and the clear stock is then placed in the serving dish. This is a technique that has been used for many years but it is only being rediscovered now. He says that once the stock is at room temperature it will become firm but will melt in the mouth very swiftly. To it he adds salicorne and then the prawn. To cook the prawn, Colagreco heated oil at 45 degrees and then removed it from the stove to cook it very slowly. At that temperature the prawn remains translucent. “This is a celebration of marine cuisine so we decorate accordingly. We use borage flower to remind us that we are close to the sea,” he said. The second dish he prepared was what he considers to be one of his best ever dishes (read interview with Mauro Colagreco on Food and Wine Gazette). This was calamari with a bagna cauda sauce from Piemonte served with an artichoke puree and rice crackers with squid ink. For the rice crackers, he boils the arborio rice with five times the amount of water. He then cooks the rice until the water is absorbed. The rice has to be well done and then it is placed in a thermomix and mixed with the ink of the calamari. It is then placed on a Silpat mat and dried for between 8 to 9 hours at 55 degrees. The artichoke puree is made by cooking the artichokes with thyme and bay leaf and lightly frying them. He uses a calamari of around 1 kilo which would normally serve around 4 people. He cuts it open from one side and then starts cleaning it properly. “Calamari meat has between 15 and 20 per cent collagen. There is also more collagen in the tentacles,” he said. 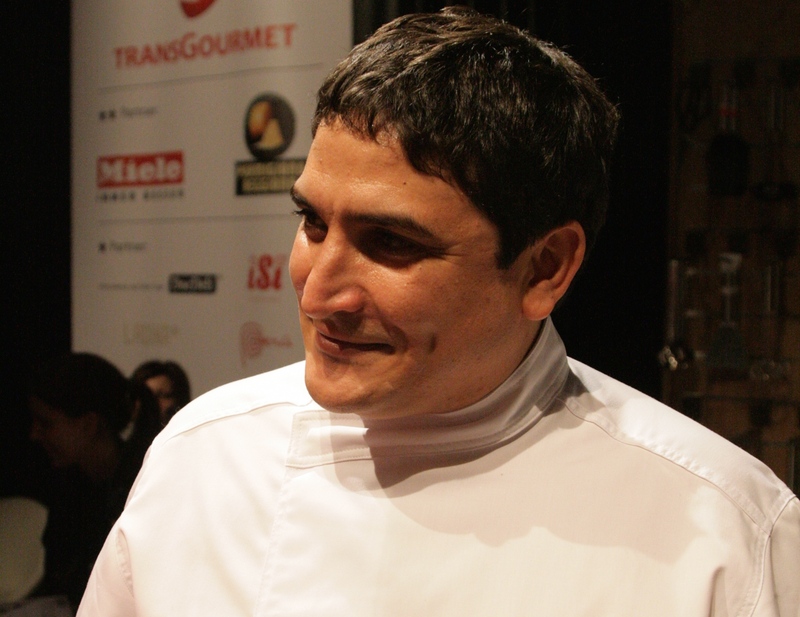 Colagreco said that the calamari are normally cooked on a grill. He made sure that the strips were touching each other and when cooked, they stuck together again. The idea behind this dish is to be able to eat the calamari with just a fork. He then finishes the dish with chives, sea fennel oil, lemon peel and drops of lemon oil and leaves to garnish. Just the smell from the cooking was enough to make you want to visit his restaurant.